These days a traveler to Italy does not have to depend on American or English guidebooks to eat well. 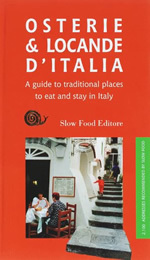 Thanks to the Slow Food organization their guide, Osterie & Locande d'Italia: A Guide to Traditional Places to Eat and Stay in Italy , which has been directing Italians to restaurants—where the chefs depend upon local organic farmers for their produce—has now been translated into English. The Slow Food movement begun in 1986 in Italy has spread worldwide (see our interview with its founder) since the day Carolo Petrini saw a McDonald’s opened in Rome’s Piazza di Spagna and determined to fight back by creating a revolutionary movement, complete with its very own manifesto (see the 1989 document), and food as its weapon of choice: Slow Food would be its slogan and its organizers would find and encourage small producers to challenge the fast food industries encircling the globe. By supporting a re-invigoration of local agriculture, the industrialized world’s benumbed palates would be “restored” by “real food” grown by farmer-artisans familiar with traditional notions of crop biodiversity and culinary traditions in Italy and abroad. We decided to test three of their listings: Two in the overly touristed cities of Florence and Siena where scores of fast food pizzerias and “tourist menu” restaurants tempt the hungry and unwary traveler; and one in a less congested but beautiful town in Tuscany. We have since been to many other Slow Food restaurants in Tuscany, as the product of the culinary craft is addictive in its own way, while remaining true to ancient food preparation traditions. The “Osteria,” which takes no reservations (or credit cards) and can be mobbed in high season, was relatively quiet at lunch time when we entered into this cool haven escaping the brazier of Florence’s streets in July. A small and cozy room furnished with antique tables and a 19th century counter, it was occupied by two groups of Florentine businessmen. The two waiters, unusually attentive (and both fluent in English) took our order for polenta with herbs, a flan of ricotta and potatoes, a traditional passata al pomodoro (bread and tomato soup), vitello tonnato (veal in tuna sauce) and cod alla livornese (with tomatoes and garlic) served with an excellent and unusual beet and green bean salad. The array of deserts, made by Picchi’s son Duccio—his other son Giulio works behind the scenes in the administration of Picchi’s “empire”—was exceptional: a bitter-sweet chocolate-coffee flavored flourless cake, a cheesecake with bitter orange marmelade, a panna cotta (an Italian version of a crème brulee) with strawberries. Next day we paid a visit to Picchi’s “Teatro del Sale,” where his wife, the actress Maria Cassi would entertain the diners with a brilliant one-woman show in which she assumed the role of several comic characters. Though the performance was in Italian and most of the audience was also Italian, English speaking diners who wished to skip that part of the evening had time to do so while tables and chairs were being arranged to accommodate the audience in front of the stage. The dinner itself was also a performance, served buffet-style from a huge glassed-in kitchen from which the cooks could observe the crowd of diners as they rushed and elbowed their way to the huge buffet table of antipasti when each new dish was brought out. Once the antipasti were served, Picchi himself appeared at a small open window to announce theatrically the service of pasta, meat, and desert. As Picchi ladeled out portions of hot dishes, diners, lined up like communicants in front of a priest, then returned to their respective tables to eat what was on their plate and wait for the next round! This was theatre on and off the stage, an experience not to be missed—and a bargain consisting of a huge selection of antipasti, pastas, risottos, meat and fish dishes and desert at only $30 a person. Via dei Macci 111R, 50122. Well off the congestion of the beautiful Piazza del Campo, we walked down a steep and quiet side street to find the “Ristorante Grotta S. Caterina da Bagoga.” “Bagoga” is the chef’s nickname from the years when he was a jockey, Pierino Fagnani in the Siena Palio, the famous yearly horse race around the Piazza del Campo. After an injury he determined to dedicate himself to his other great passion, cooking. From 1973, his restaurant, much frequented by the Sienese, has served the specialties of the region and was a logical entry into the Slow Food guide. Bagoga, an ebullient and delightful host who emerges frequently out of the kitchen to talk to his customers and to his son, the sommelier, is a great source of information on the culinary history of Tuscany and of Italy as a whole. Our meal was by far the best we’ve had in the 35 years of visiting the city. It began with a flan of cheese and truffles, accompanied by a glass of Castello di Pomino, an exceptional white wine from pinot bianco grapes imported from Burgundy in the 19th century by an ancestor of the wine producing Frescobaldi family. Gnocchi with truffles, papardelle (wide ribbons of home made pasta) with spicy wild boar sauce, were the best we had ever tasted. The meat course, accompanied by a Vino Nobile di Montepulciano, was based on a Renaissance receipe, “Gallo Indiano,” (turkey or chicken cooked “in the Indian style”) made with a sauce flavored with the spices used in the traditional sweet cake of Siena, the panforte. The desert was also unusual and delicious: A rice pudding to which whipped cream, egg whites, raisons, and nuts were added, the whole drenched in fresh berries. Everything had been bought from the farmers in the surrounding countryside For $35 we ate like Sienese nobles! Via della Galluzza, 26, tel: 30 0577-282-208. Papardelle with spicy wild boar sauce at Bagoga in Siena. Pierino Fagnani, chef and owner of Bagoga. These are just a couple of the many fine restaurants which can be found in the the Slow Food guide, Osterie & Locande d'Italia: A Guide to Traditional Places to Eat and Stay in Italy, filled with addresses, which, until 2007, had been available only to Italians. Now English speaking travelers can get in on the secret.